Converse has made quite a few shoes with the Chuck Taylor name on them. Of course, Chuck's name is most frequently associated with basketball shoes. 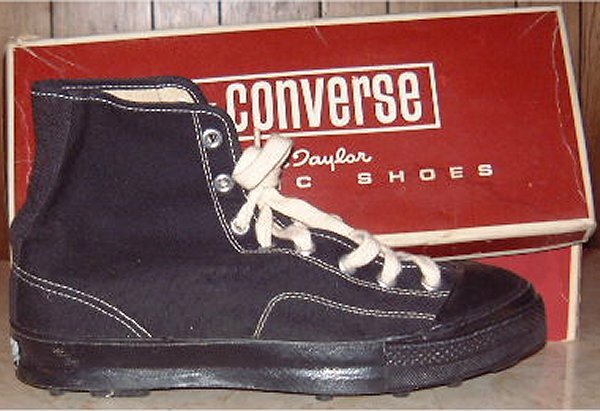 I can remember the Chuck Taylor wrestling shoe. I can also remember the design of the Chuck Taylor track shoe; but by the time I was getting out of store-brand "Chuck clones", they had disappeared from the market. 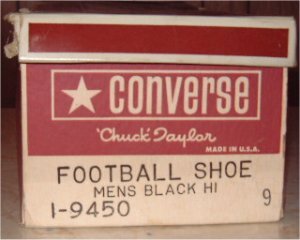 The Chuck Taylor football shoe, on the other hand, was a complete mystery to me until one of my readers (Ed) asked me about it. He was kind enough to scrounge up some pictures of these mysterious shoes. Later on, I had somebody else send me some more pictures, asking me if I knew how old the shoes were. Ed told me that these were also nicknamed "Six-Man Shoes." This term is after six-man football, a variant played in small, rural school districts that don't have enough kids willing to play regular football. I'd never heard of six-man football until I lived in West Texas between 1992 and 1994. Ed wore them for soccer in 1964 and 1965, but he also told me that his school football team wore them. This is a view of the outside along with a partial view of the box lid. 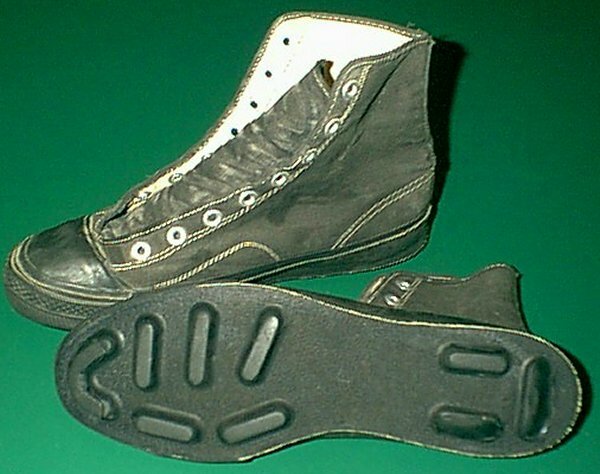 The bottom of the "Chuck Taylor" Football Shoes had broad rubber cleats. 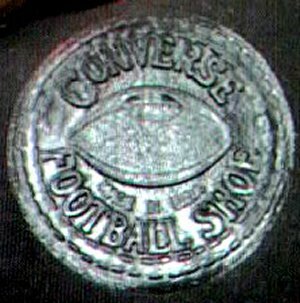 Here's the ankle patch: similar to the monochrome black Chuck Taylor canvas basketball shoe, but with a football on it. There was also a low-top version of these shoes. Ed told me this one. After hearing the name "Six-Man Shoes," and noting the shoes had eight eyelets on each side, one kid made a smart-aleck remark to Coach: "If they're Six-Man Shoes, why do they have eight holes?" Coach didn't think that was very funny... the team had what was has been humorously called a "track meet."